Because we are STILL your number one source for all that is COLLEGE GAMEDAY, we simply must, must, must let y'all know where you can find the dumbest humans that are NOT working in the Barry White House. The short bus shall be traveling up to Eugene, Oregon because they do not want to be around any college footbaw this weekend. That makes three weekends in a damn row that College Gameday has not attended a footbaw game. I think that trip to Provo, Utah wore the guys out. From what I hear, there are quite a bit of farm animals around Provo and Streit Herbkirk is done wore hisself slap out from pumping Elsie. Anyhoo, the only college that I am aware of in Eugene is Northwest Christian University and they do not have a footbaw team. I guess that the College Gameday folks are heading up there for a much needed weekend off from publicly embarrassing themselves. 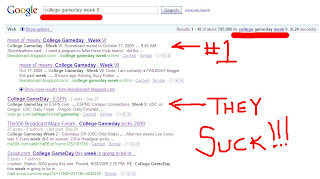 I think that the university of Southern California Community College has a BYE this week, but I could be wrong.